Starring: Demetri Martin, Emile Hirsch, Eugene Levy, Imelda Staunton, Jeffrey Dean Morgan, Liev Schreiber, Paul Dano, Richard Thomas, Dan Fogler, Edward Hibbert, Henry Goodman, Kevin Sussman. I’m starting to lose count on the amount of times director Ang Lee has tackled a new genre. He’s done martial arts; comic-book; thriller; romance; family drama; westerns and literary adaptation. Now? 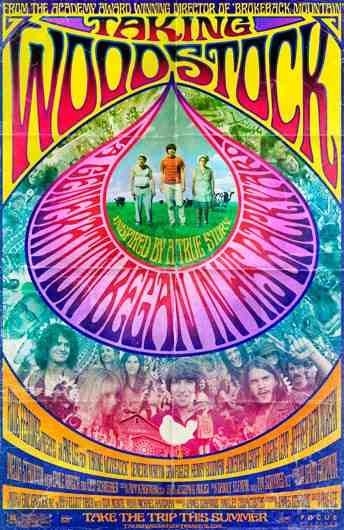 Well now, he’s tackles the story of how the legendary music festival “Woodstock” came to be. Elliot Teichberg (Demetri Martin) discovers that a music festival near his family’s motel has lost its licence. Trying to save his parents’ business, he calls Woodstock Ventures and offers to help them stage the gig at a farm in White Lake. What happens after that, has now went down in history as a legendary free-spirited musical weekend. 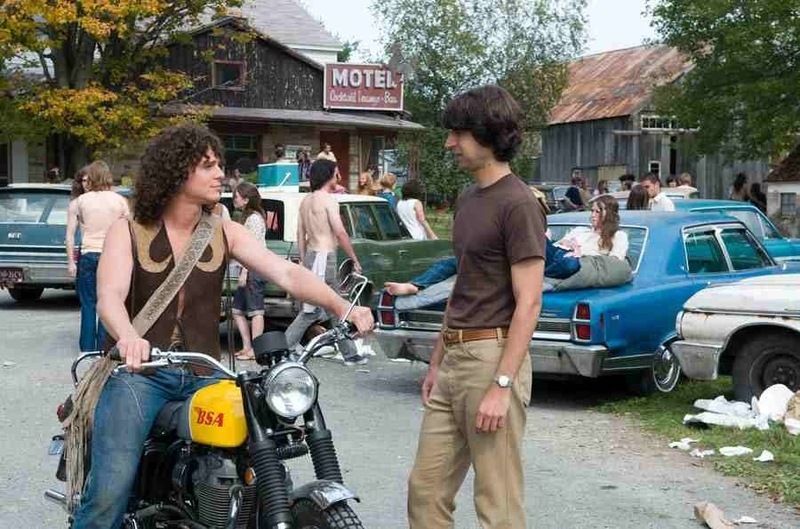 Anyone trying to craft a film worthy of the magic of Woodstock would have their work cut out for them, so wisely Ang Lee focuses on the outskirts of the infamous hippie festival of the 60’s. Instead of focusing on the bands or what was happening on stage, we experience the effect this time had on the people off stage, through several characters – mainly Elliot and his right of passage. It’s a light-hearted little film that is very slow to get going and definitely overlong. The talky first half is all about the organisation and chance encounter with promotors. This threatens to kill this whole film but when the festival gets underway, the second half is a lot stronger as the characters begin to loosen up. It sheds a bit of light on the effect this time and place had, but really there isn’t a lot else happening. Maybe it would have been better had the focus been on stage. What I found most interesting was the depiction of Elliot when high on acid. Speaking from personal experience, it’s the most realistic depiction of hallucinating I’ve seen on screen. It’s not overdone but shows more the vibrancy of colours as they move and bleed into one another and the almost ocean like movement of a large crowd of people when dancing together. You would think with this depicting a defining moment in the whole 60’s ‘movement’, it would have something more than a very lesuirely pace. However, when the drugs and music start to flow, the film flows with them. Disappointing but it has it’s moments. This entry was posted on January 10, 2012 at 6:20 pm and is filed under Comedy, Drama with tags 2009. You can follow any responses to this entry through the RSS 2.0 feed. You can leave a response, or trackback from your own site.